Hurricanes generated in the northeastern Pacific Ocean off the coast of Central America have not impacted the continental U.S. but most have traveled in a more westerly path towards the Hawaiian Islands. In fact, the only hurricanes to make landfall in the U.S. in the 20th century did so along either the Atlantic or Gulf coasts. However, there is increasing concern that, as a result of global warming, hurricane severity and storm tracks will be affected. Should the Pacific Ocean waters off California warm, hurricanes that are spawned in the tropical eastern Pacific Ocean might reach the U.S. before dissipating. This research examined the vulnerability of the central California coast to hurricane strikes. For this analysis, the hydrologic impacts of hurricane strikes were generated, and then compared with extreme storms of record. 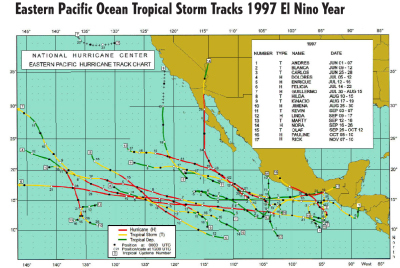 The hurricane strike scenario assumes that hurricanes similar to Dennis and Floyd that struck North Carolina and Virginia in 1999 are representative of the types of hurricanes that could strike California. Hurricane Dennis was category 1 and Hurricane Floyd was category 2 at the time of landfall near Wilmington, and were spaced about two weeks apart. The west coast watershed examined was the San Francisquito Creek watershed in the Santa Cruz Mountains.